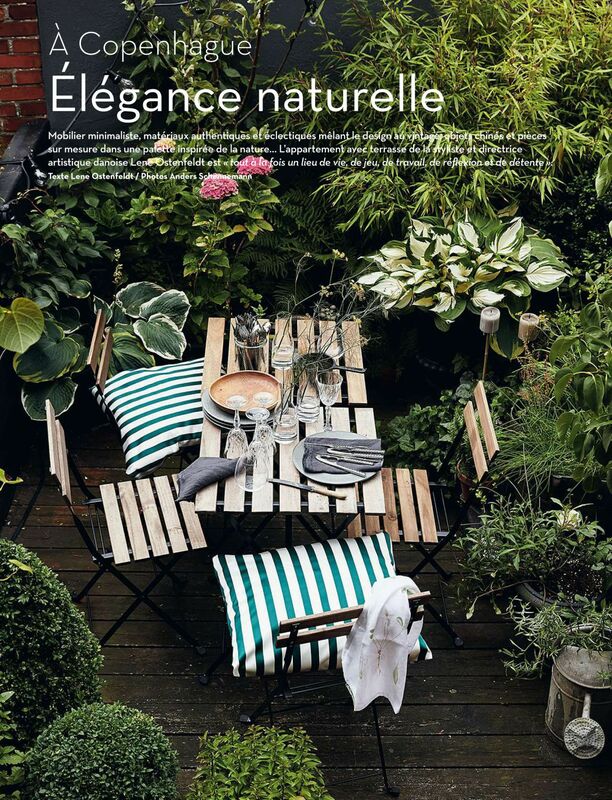 Simply furnished and featuring a mix of honest materials, handpicked and custommade design and vintage pieces – all in the colours of nature. 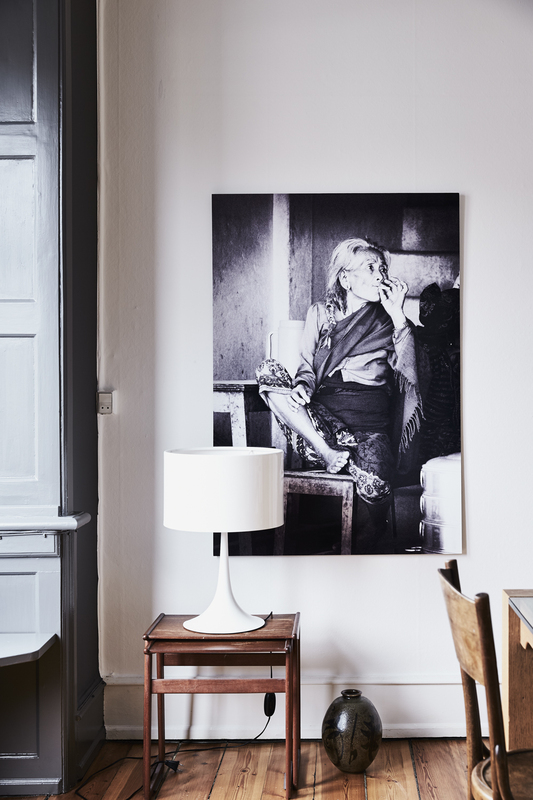 The apartment of Danish stylist and art director Lene Ostenfeldt is base for both living and working. The wooden floor squeaks, the walls has a freestyle leaning and you can glimpse the pattern from the old wallpaper under the recently painted walls. One could well imagine that when you work professionally with art direction, interiorstyling and design and constantly know whats going on, the private base might be heaven when it comes to the latest furnituredesign. 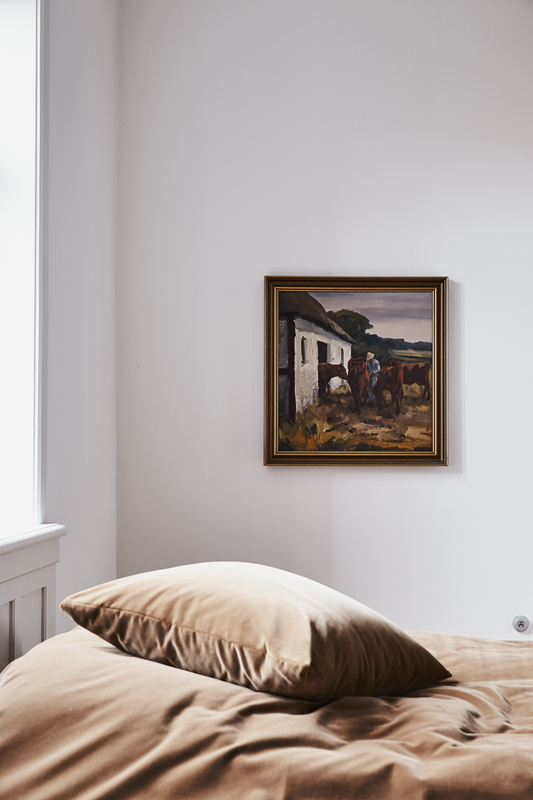 But this is not the fact for art director and stylist Lene Ostenfeldt who invites us into her combined private home and workstudio in the city Holbaek in Denmark, just an small hour away from tha capital Copenhagen. The apartments architecture is with big, open rooms and windows facing both the busy street and the quiet backyard of the four-apartment brick-building. The 167 square meters is decorated with one-off things, new design and selected furniture that has a sentimental value for Lene Ostenfeldt. She knows how to pull the decorative elements in the house forward and create a saturated atmosphere completely bypass the standard solutions. “My home is my base, a grounded fusion of uncomplicated design and humble materials – it has trough many years transformed itself from being a styled setting to the backdrop where I express my creativity with areas for living, dining and working. This is where I live, play, work, think and hang out “. “I am often asked whether I live with my favorite designs – I do not. A home is for me where I can collect energy and retreat, a place that tell`s stories. It must be atmospheric and cozy. In my eyes is it the way you live that’s makes a space for a home – it´s not expencive furniture and trending design and apppliances “. “My home is made up of an eclectic mix of modern design which I have chosen and purchased, often by chance and put it together with heirlooms, one-offs and flea market bargains I have renovated or simply given a coat of paint. I have tried to get rid of the piano several times, but it must obviously not succeed and now I`m so happy with it, especially when my son Simon, who is a drummer, are at home in companion with pianists who really knows how to use the keyboard “. ” Personality is not something you can buy yourself into, it occurs when you choose what you like and do not let trends regime. 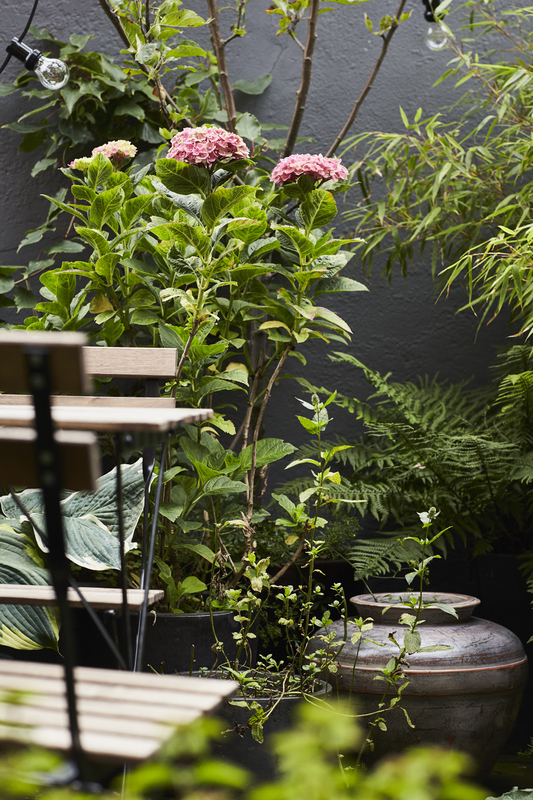 If you are looking for creative and unpretentiously inspiration for your home, it’s a good idea to book table on a restaurant, a bar or take a look at the new, smaller boutiquehotels’ décor popping up around the world. “In the last 4-5 years is conceptual and massproduced hotel furnishings on retreat and replaced with hand-picked design, custommade furniture, vintage finds, soft fabrics and lots of colors – hotels are looking for creating an informal atmosphere where good company and food are in focus and make you feel that you are at someones home, ” elaborates Lene Ostenfeldt,” the most important interior-tip is that you try to accept and use the things you actually have, the throw-away culture is passed long time ago. That’s life, be happy where you are and whats in front of you. This is also what a home is for me “. 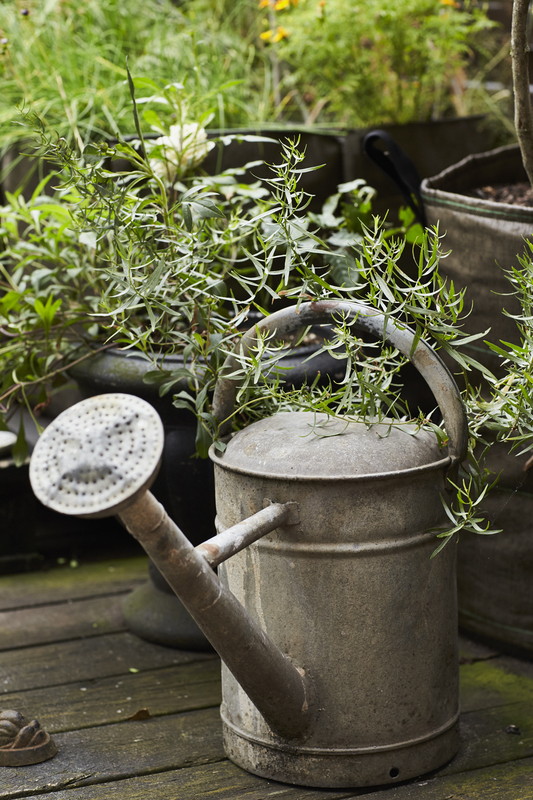 An old watering can in zinc is growing space for fresh tarragon. 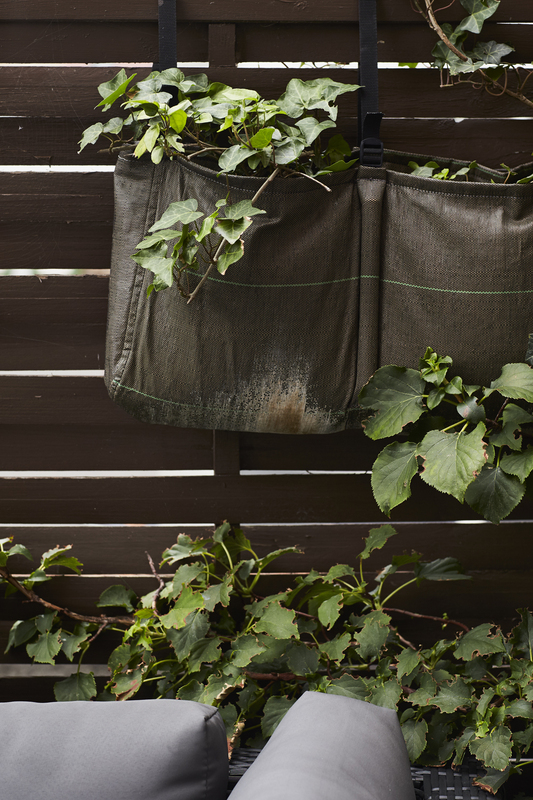 Behind plant bags from french BacSac. 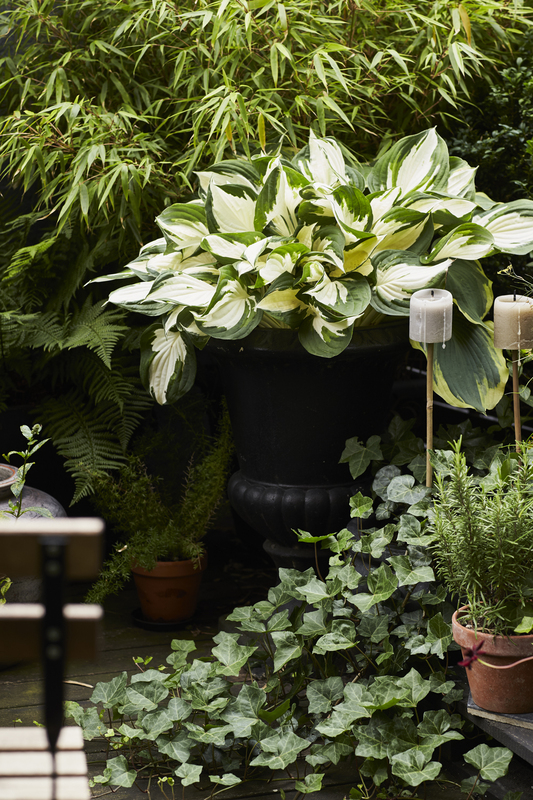 The black vintage plant pot was originally in light marble, now it has black paint and through time a charming patina. 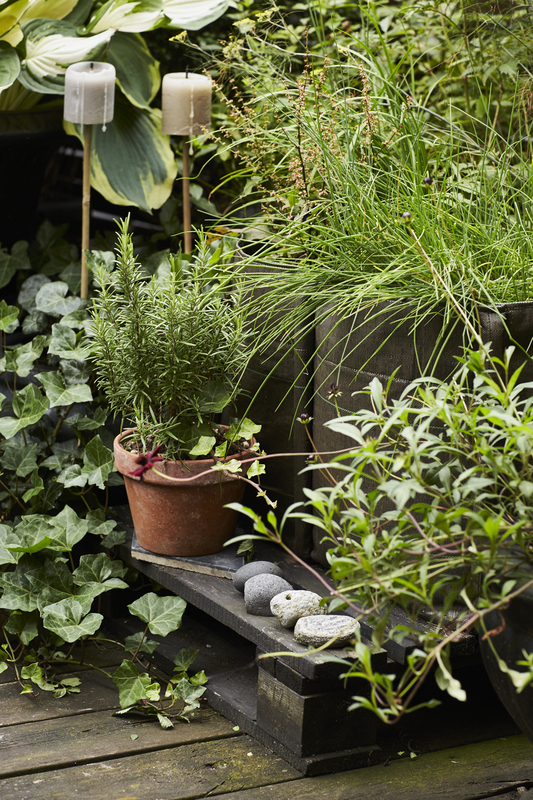 There is also beautifull and natural still lifes outdoor in the urban garden. Chives, parsley, red salad and bronze fennel grows in a huge plantbag from french BacSac. 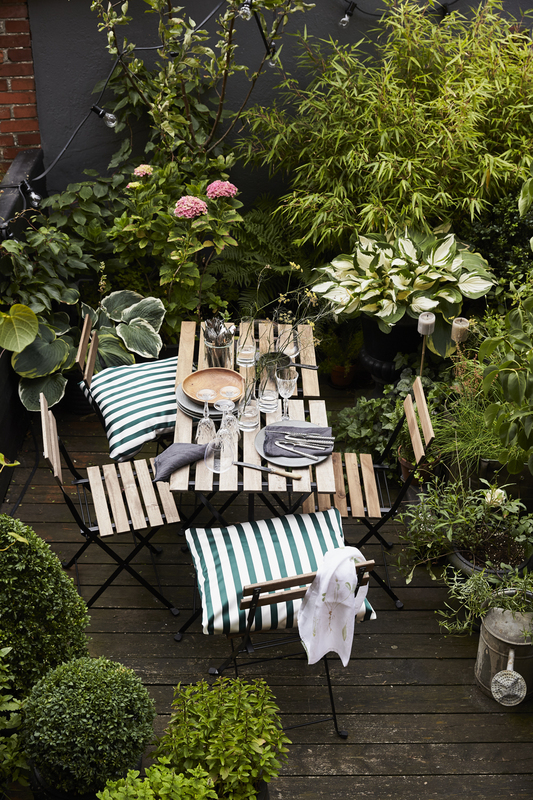 In order to provide air and prevent plants to rot at the bottom, Lene raised it from the terrace floor on a black painted euro pallet. Out on the roof facing the courtyard is a wonderful oasis. 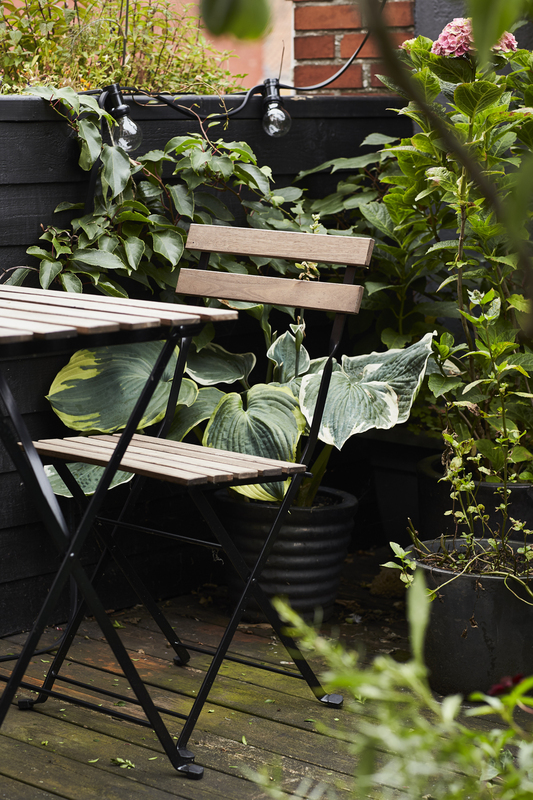 ” I collect energy out here, immerse myself in something potting soil or a book, enjoying the morningsun with a coffee and the stars at night,” says Lene Ostenfeldt. 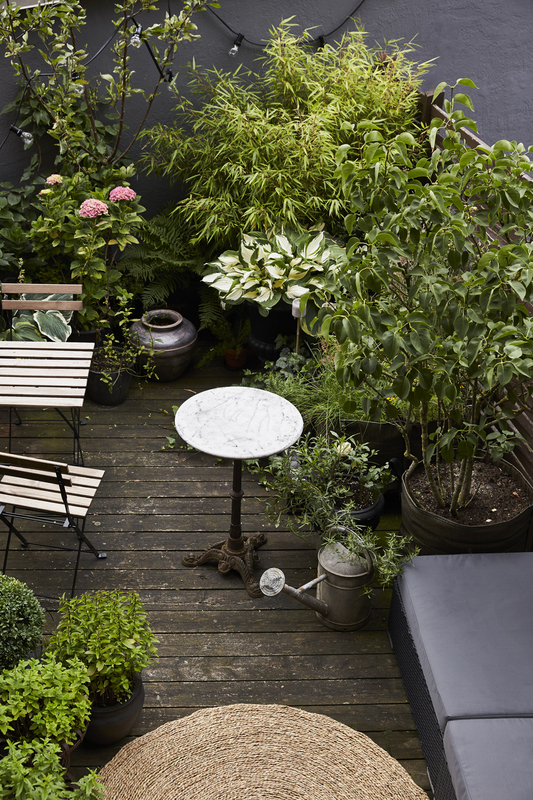 The terrace is 15 square meters and filled with large and small mobile containers with different bamboo, hydrangeas, ferns, evergreen hosta, ivy, lots of herbs, a lilac, a pine and an apple tree. Lightchain from swedish Konstsmide creates atmosphere at dusk. Folding table and chairs from IKEA. The marble table is French vintage. 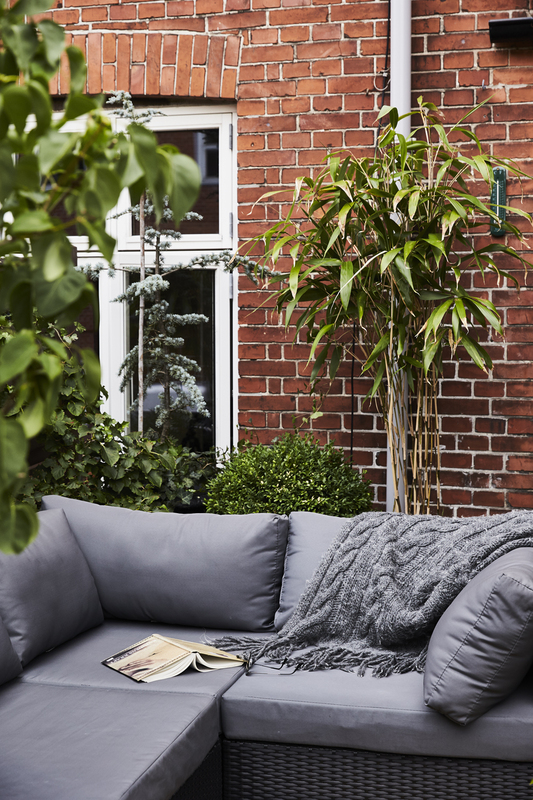 Outdoor wicker couch and seaweed carpet are both from Bauhaus. 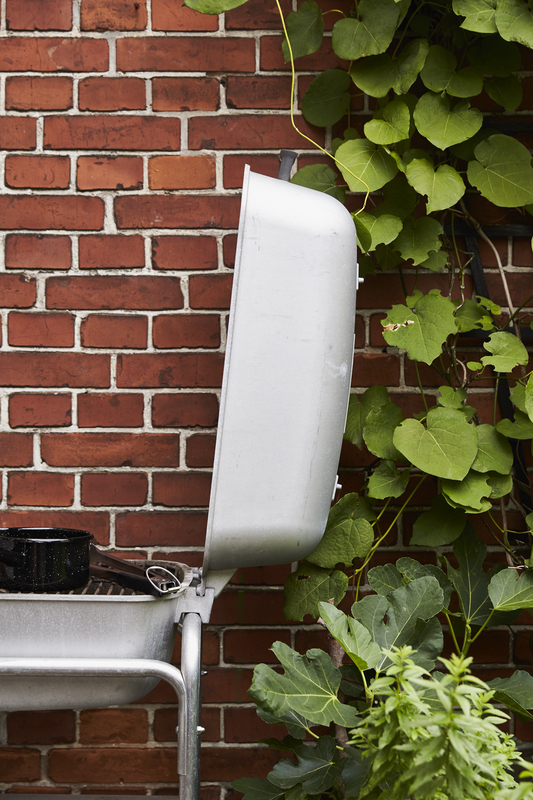 The barbecue in stainless aluminum is American and originally designed for soldiers in the field under the war. A tobacco plant climb on the brick wall, fig and lemon verbena in pots. From the kitchen there is a view of Holbæk’s old timbered houses. The kitchen table is actually a little low for dinning, but Lene likes the expression of it, there has been many good meals, present gatherings and cozy conversations here. A bookshelf in dark wood is painted white and covered with Designers Guild wallpaper on the backplate. Here are kitchentools, an old kitchen scale, plates, jugs, dishes and bowls beautifully and ready-to-use on display. 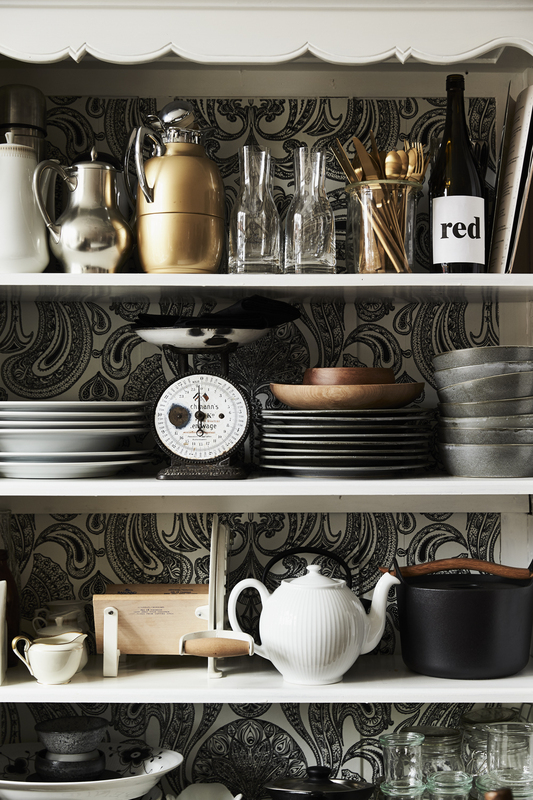 The stoneware, gold cutlery and small water carafes are from Christian Bitz, gold-thermo from Alfi, white teapot from Pillivuit, cast iron pot with wooden handles from Iittala. The bottle of RED-label Lene Ostenfeldt designed for a styling in a magazine. 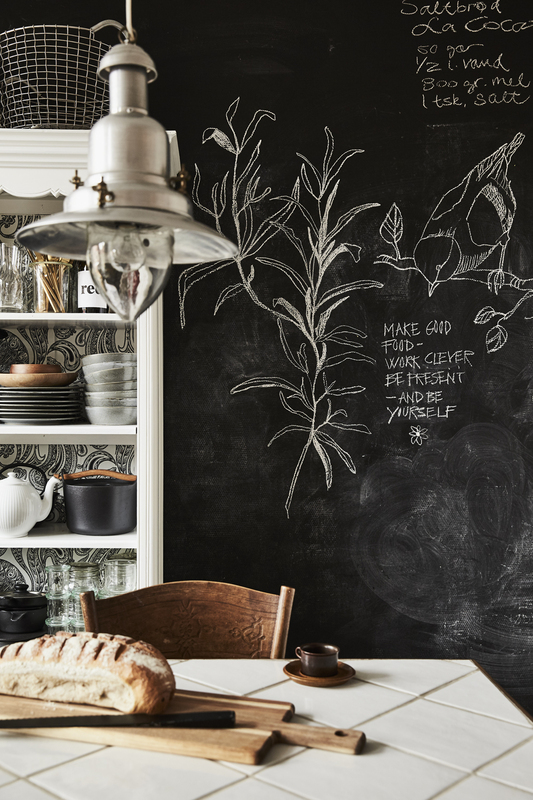 The wall in the kitchen is painted with blackboard paint and used for sketches, recipes and quotes. The dining table is an old kitchen table in wood with drawers. The original linoleum tabletop is replaced by Lene with white ceramic tiles. On top of kitchenshelves a wire basket from Korbo. 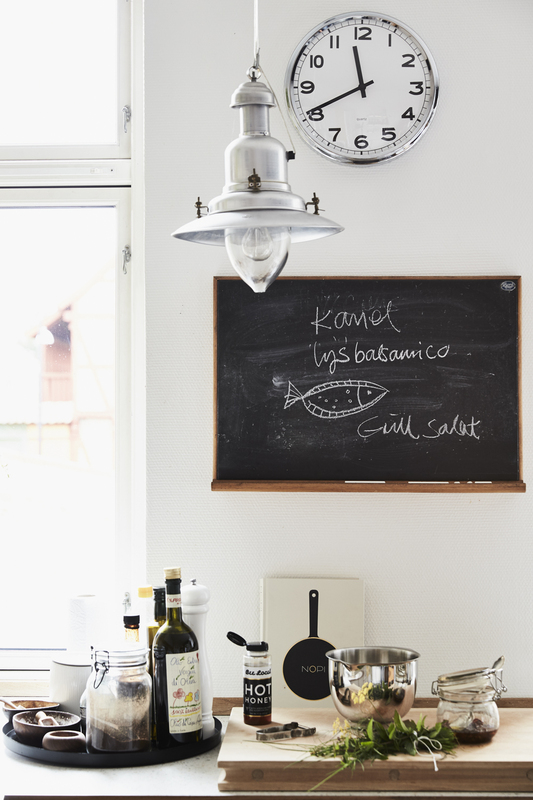 Fishermens-pendant in metal and brass above the kitchentables, is cozy and practical work-light. School board used as a shopping checking-list. A large round metal tray is usefull to keep oils and spices on track. 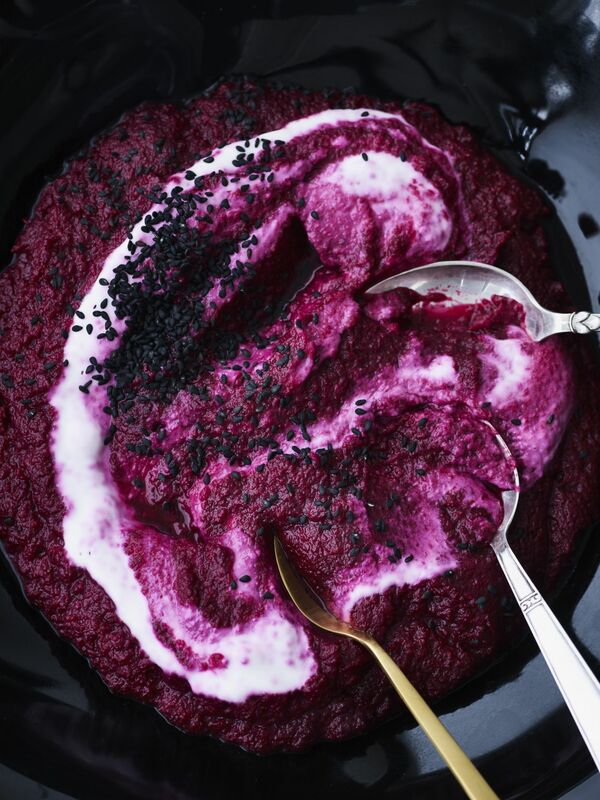 Wall clock from IKEA, danish Margrethe Bowl in stainless steel from Rosti, book NOPI of chef Yotam Ottolenghi`s – who Lene is a big fan of. She enjoy and has a great interest in experimental cooking, goodies from all over the world is often incorporated, like this chili-honey from New York. 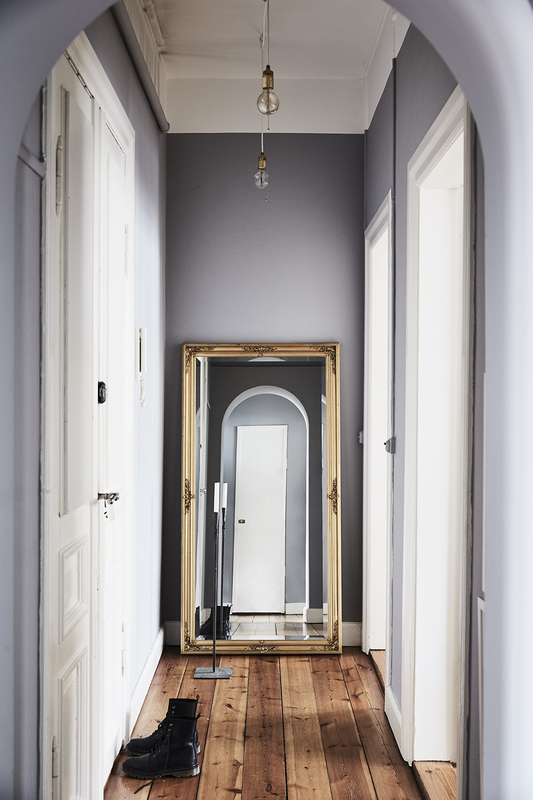 A large golden framed mirror makes the hall visual longer and highlights the propertys beautiful, original floor planks. 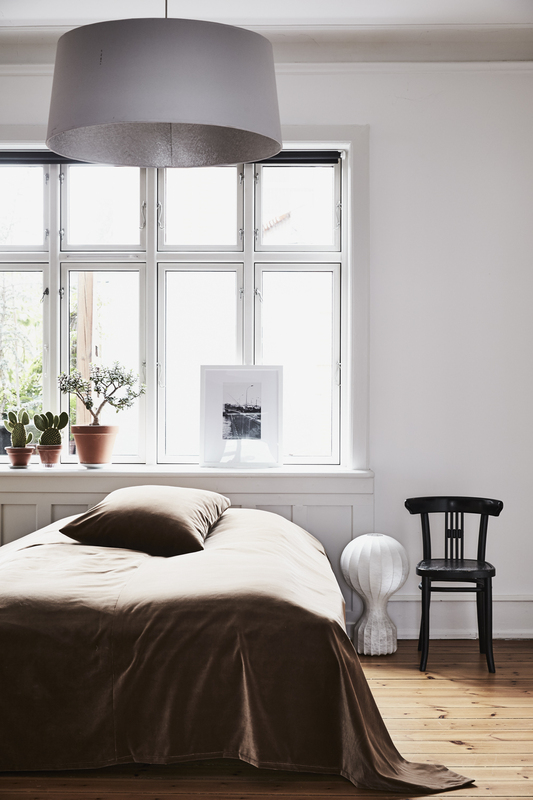 The walls are painted in flat lightgray from Flügger, the color end about 40 cm from the ceiling, it makes the room visual lower and more intimate. The welcomming atmosphere is emphasized by incandescent lamps with brass socket and textile cable from designcompany Raumgestalt Nicolaj. The door barely visible in the mirror, is a walk-in wardrobe and keeps the hall tidy from coats, shoes, bags and suitcases. Every wall in the large workspace and studio is painted unconventional. 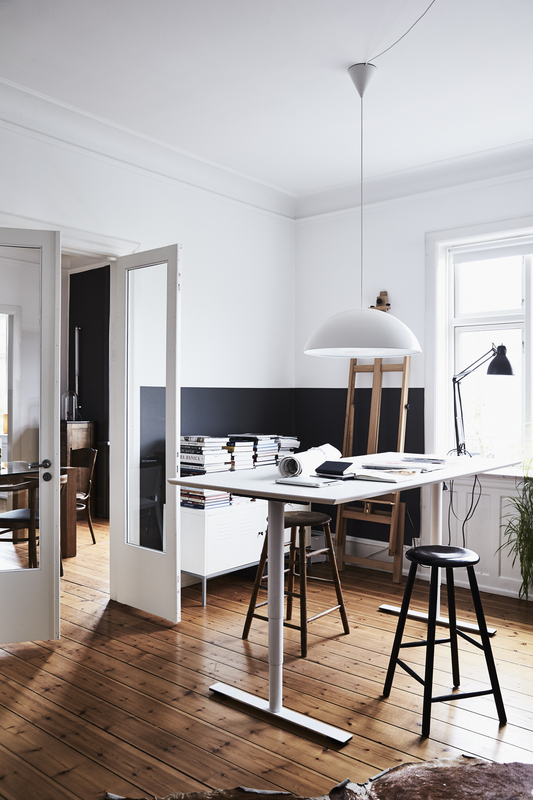 The dark gray color, which is repeated in the bay window in the living room, ends in the middle of the wall and acts as a panel and highlight the original wooden floors and the white woodwork around windows and doors. Worklamp is Luxo designed in 1937, Lene Ostenfeldt bought the pendant over the table for 5 pounds at a local recycling shop. It was sanded, painted with glossy spray and had a new wire. Atelier stool in wood is from Lene`s dad who was an artist in his spare time, the black stool is from a wood-shop and has been painted black. Height-adjustable table is oversized, 2 meters long made-to-measure at a company selling office equipment. The combination of dark gray and white is elegant and highlightet with pillow and blanket in the same shade. The fabric is recycling; Lene has made it of velvet, the previously curtains in the living room. Table lamp from IKEA. 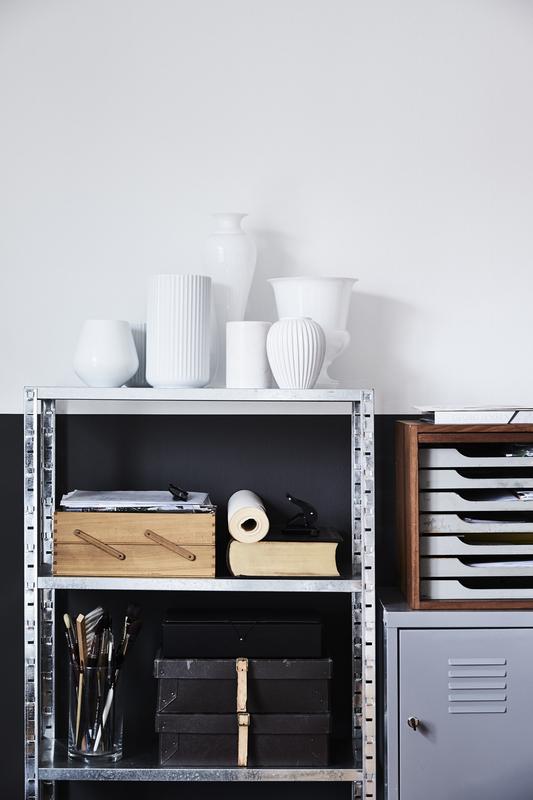 In the workspace operates a steel bookcase from the construction market as storage. 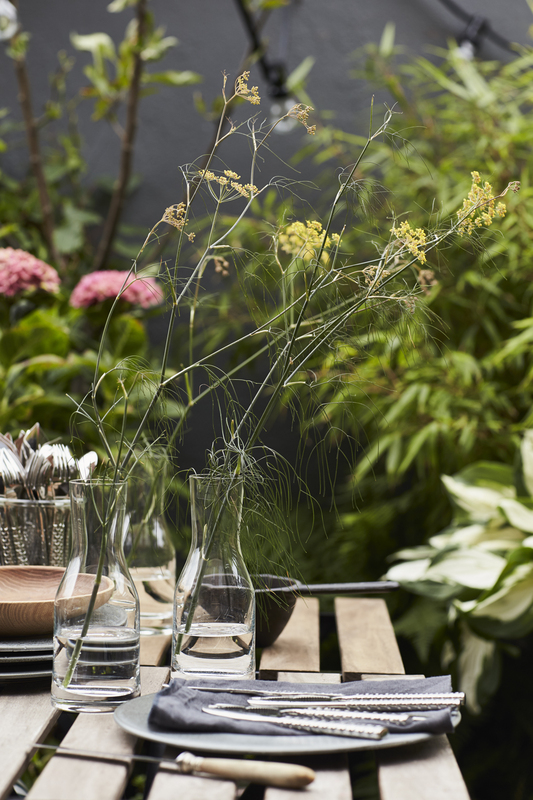 On top, a collection of vases from danish designcompanies Holmegaard, Lyngby Porcelain, Royal Copenhagen and Broste Copenhagen, a discreet and powerful still life. Small drawer in teak is vintage and a heirloom. Gray metal cabinet from IKEA. The large living room is divided into a dining and a socializing area. The chair front is Lene’s father’s old office chair that has a new upholstered seat in coffee brown leather. On the piano a tableau of candlesticks and vases in ceramic, porcelain, wood and marble. Hand-painted roses are Lene`s sketches for a new project. Photography by Lene, shot in Istanbul Istanbul. Table lamp in mouthblown opal glass is Claudia from DAB. The bay windows and panels defines the dining area and is elegant highlighted in deep dark gray tints for wood, Flügger S7000-N, define the dining area. The space under the bench act bookcase. The dining table in solid oak with thick glass, Lene Ostenfeldt designed it and had it produced in a workshop for people with special needs. The chairs are a mixture of Kartell, designed by Piero Lissoni and heirlooms. The industrial chair was found in a container. Woman is photographed on a trip to Nepal by Lene Ostenfeldt and enlarged. Nesting tables in teak are heirlooms, the white table lamp called Spun Light was designed by Sebastian Wrong and from italian Flos. Ceramic on floor is an unique vintage piece from danish Bing & Grøndal. Behind the double glass doors is the workspace. Above the table pendant by Kartell. 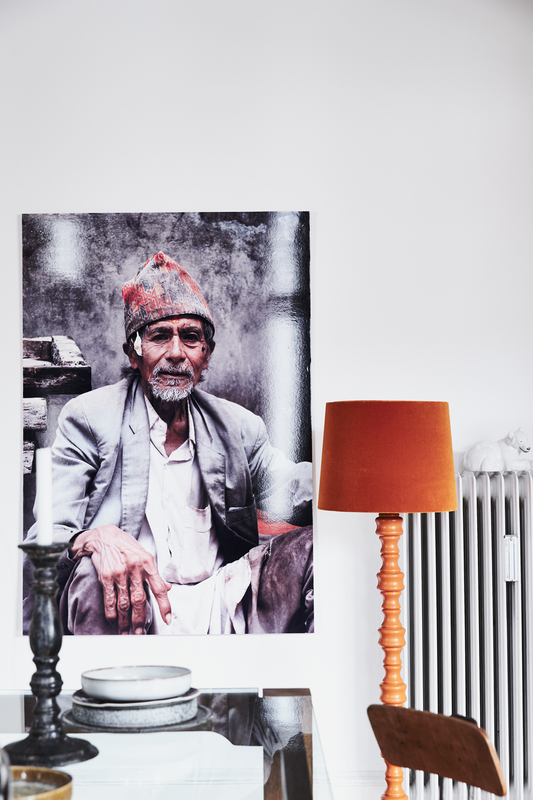 The portrait is a working man from the pottery town Thimi, photographed by Lene Ostenfeldt on a trip to Nepal. The lamp, a retro-discovery, she has painted it orange to match the photograph. The lampshade is from KS Lampshades are made to order and upholstered with fine velvet from Designers Guild. On the heater porcelain polarbear from Royal Copenhagen. 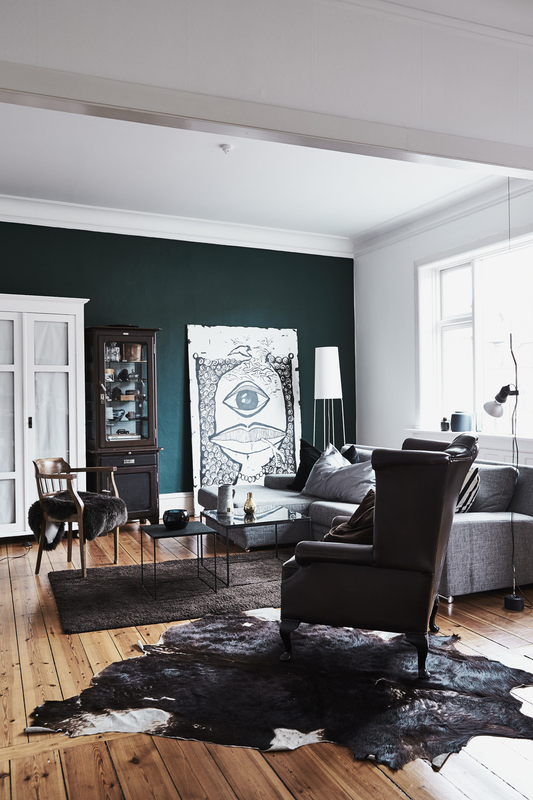 Color in the livingroom is dark green Flügger S7020-B70G and with a matte finish. 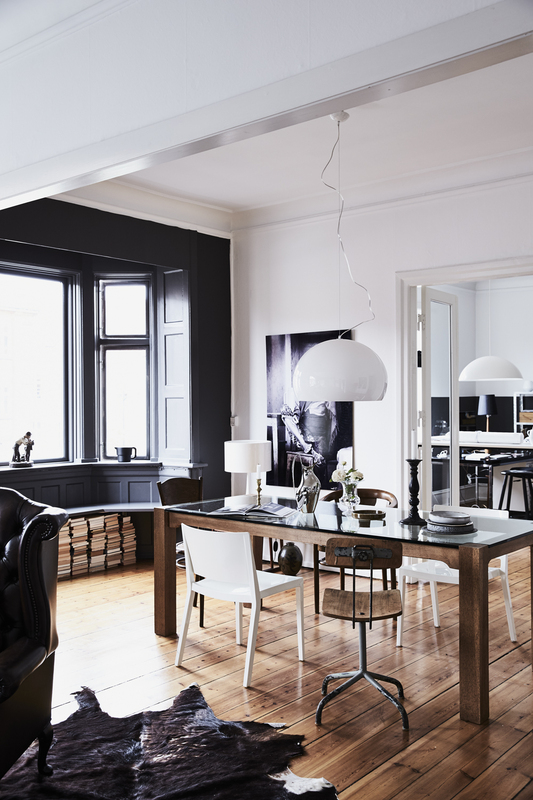 It both highlights and gives edge to the brown, black, gray and white colors in the room. The sofa is from Ilva with pillows Lene has stiched in fabrics from Designers Guild and Ralph Lauren. The brown leather chair is Chesterfield. The painting is one of Lene’s own. 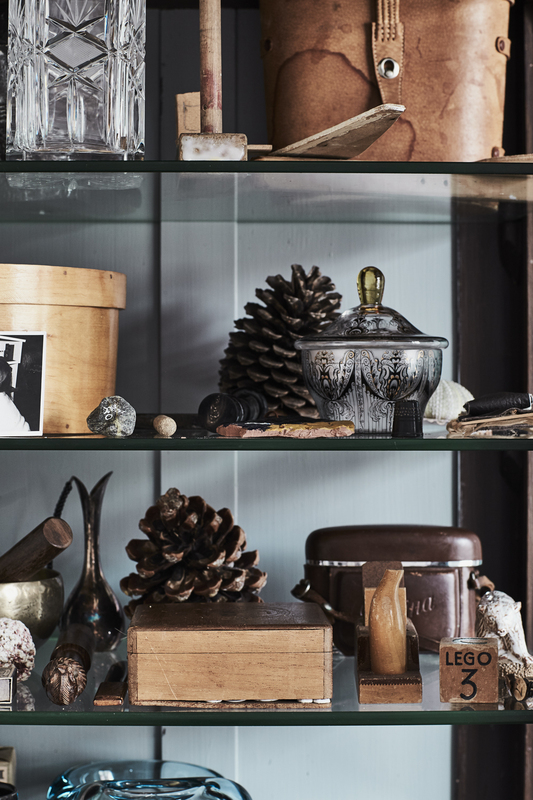 The display cabinet is an heirloom, it is reported that it has been going on a “secret medical clinic” in southern Jutland in Denmark, Lene`s childhood. An old linen-closet is painted white with new glass doors. 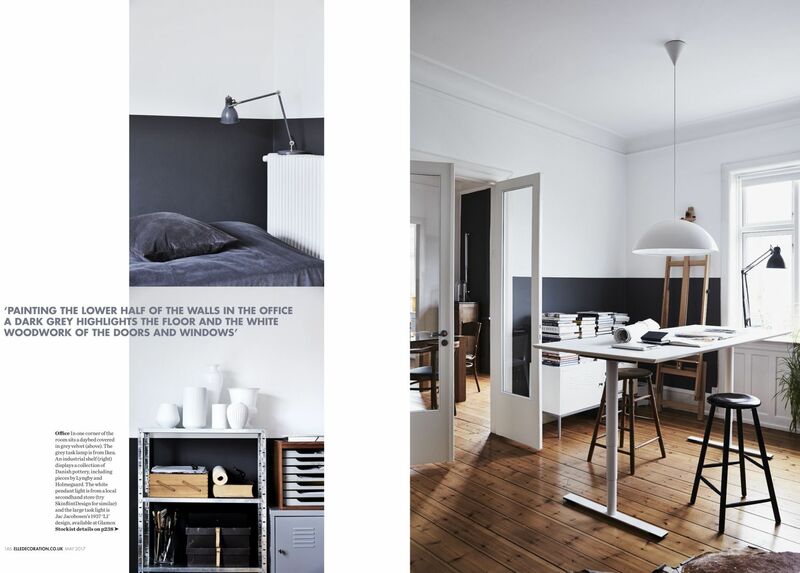 The floor lamp named Slim Sophie from German Frau Maier, spot is Parentesi by Flos, design Achille Castiglioni. Floorlamp is Ipnos form Flos, design Nicoletta Rossi and Guido Bianchi. The display cabinet is an exhibition of curiosities. Every detail represent a personal memory from a person, an experience or a trip. A pine cone from a holiday in italy, a cigar box filled with buttons, a wooden boat Lene’s son has built when he was a boy with a small hammer of a drumstick, a stone found a special day at the beach, a 100 year old bonbonierre Lene got sweets as a child at his grandmother, building block of wood from LEGO`s very first production. The back wall of the cabinet is painted light gray, the same color as in the hall. A creative mind is always working. Lene brings always her drafting and notebooks on travels and trips. She relax with the sketchbook. A notebook is used for writing and drawing cooking-trick and delicious food eaten around the world and with friends and family. 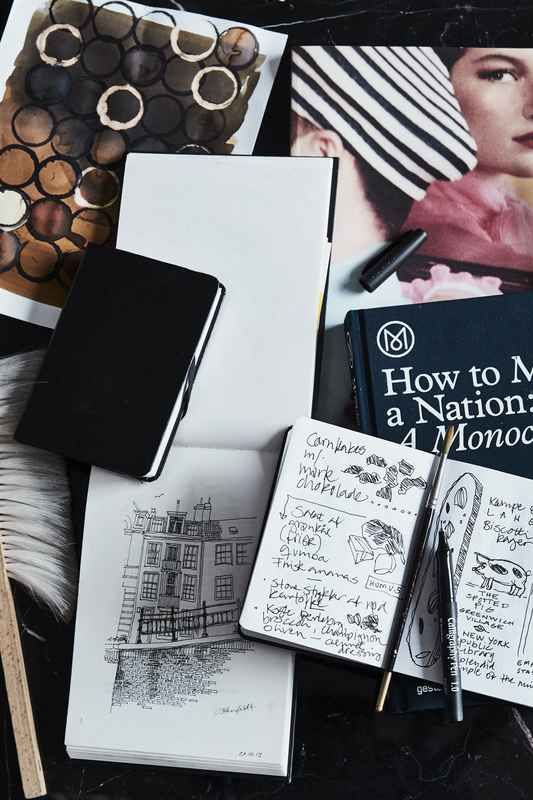 Book How To Make A Nation is from Monocle. Watercolor is an outline design for print. The bedroom faces south and the roof terrace, is simply furnished. Bedspread and cushion Lene stitched in bold velvet from Designers Guild. The color is called Cassia Hazel. The chair is original Thonet, found at a flea market for 4 pound. 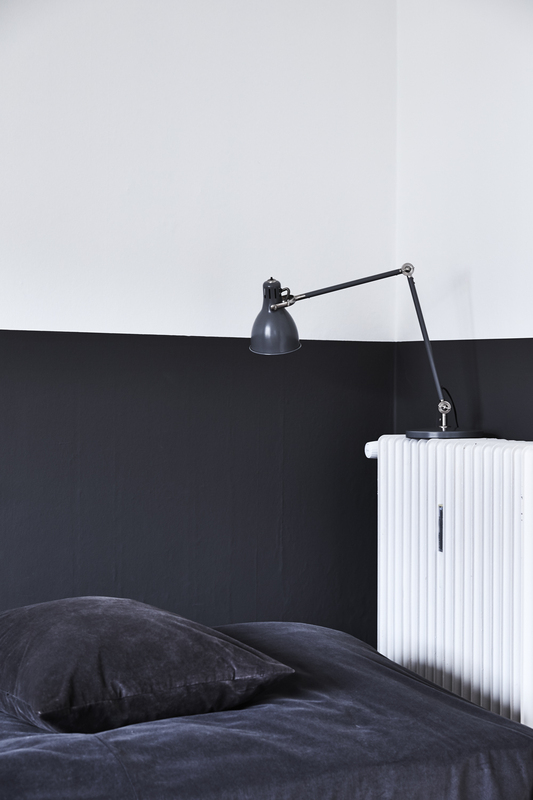 The floorlamp is Gatto from Flos, designed by Achille and Pier Giacomo Castiglioni. Photography is the Galata Bridge in Istanbul, taken by Lene Ostenfeldt. In the ceiling, Lene made a pendant of a gigantic lampshade found at a sale. The apartment overlooks both the courtyard and the street. From the bedroom there is access to the roof garden facing the courtyard. 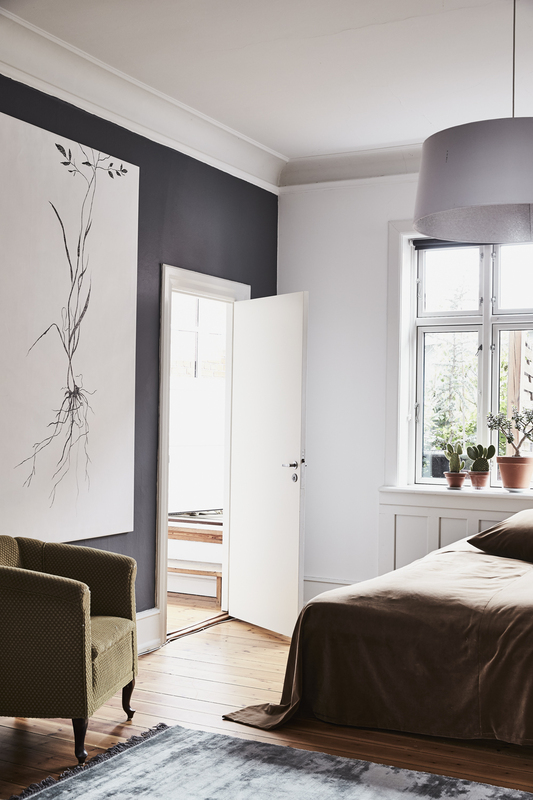 The large painting is from a series of black-and-white line drawings of edible Nordic plants and roots, by Lene Ostenfeldt. The carpet is Almeria Stone, crafted by hand in silk and viscose from danish Linie Design. The bathroom has a minimalist décor all in white-on-white. 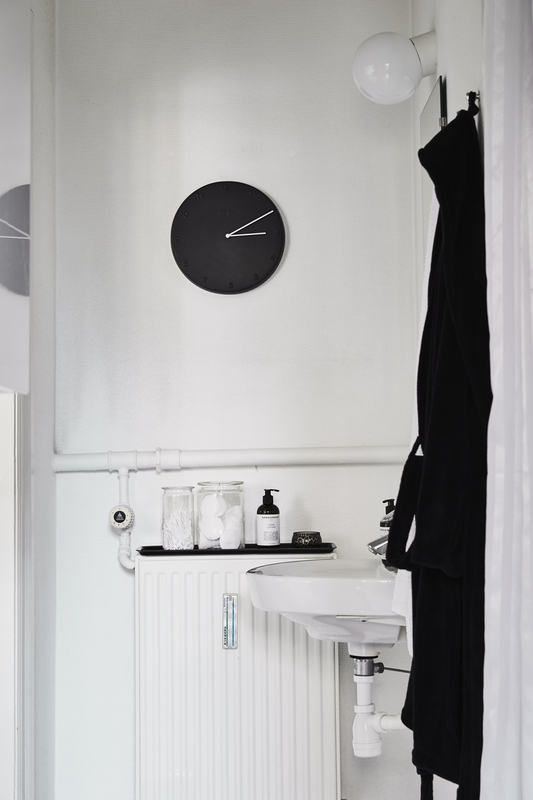 Wall clock in ceramic from Kähler. Beautyaccessories stored in old jars on a black melamine tray from IKEA. Hand lotion and soaps from Norwegian beauty brand Sprekenhus. Træplankerne på gulvet knirker, væggene er skæve og man kan skimte mønstret på det gamle tapet under de malede vægge. Man kunne godt forestille sig, at når man arbejder professionelt med design, styling og boligindretning og har fingeren på pulsen, så er den private base et mekka af alt det nyeste design og møbler. Men sådan er det ikke for en af BO BEDRES faste stylister, Lene Ostenfeldt der inviterer indenfor i sin private bolig i Holbæk. Herskabslejligheden på 167 kvadratmeter er indrettet med unika-ting, nyt design og udvalgte møbler der har en affektionsværdi for hende. Lene Ostenfeldt forstår at trække de dekorative elementer i boligen frem og skabe en mættet atmosfære helt uden om standardløsninger. ” Min bolig er mit hjem – og har gennem mange år transformeret sig fra at være en kulisse og udtryk for min kreativitet til at være rammerne omkring min kreativitet. Det er her jeg lever, leger, arbejder, tænker, roder ”. ” Ved at blande, sætte tingene sammen på en anden måde og male væggen eller en stol eller lampe i farve, så får man et helt nyt resultat der giver fornyet energi og stemning. Vi skal turde lege og eksperimentere lidt mere og tage os tiden til at vænne sig til et nyt udtryk. Jeg kan godt lide at det er lidt skævt og uforudsigeligt. Og jeg holder særligt af naturmaterialer fordi de patinerer. Skønheden består i at de bliver brugt, et hak, et mærke eller en ridse gør det kun mere troværdigt ”. ” Jeg særligt glad for at arbejde med mørke farver som kontrast til lyst og kridhvidt. Det dunkle kan være særdeles raffineret. Kaffebrunt, karamelfarvet, sort, grå og kridhvidt. Stål og messing. Velour, pels og læder. Farverige detaljer – en flaskegrøn væg og en varm orange gulvlampe. Møbler og tilbehør behøver ikke passe sammen, det vigtigste er at farverne harmonerer, så kan man mikse ret vildt, slippe af sted med en hel del og stadig få det lækre look ”. ” Jeg bliver ofte spurgt om jeg selv bor med mine yndlingsdesigns – det gør jeg ikke. Hjemme er for mig et hvor jeg kan samle energi og få ro, et sted der bærer på historier. Det skal være stemningsfuldt og hyggeligt ”. ” Mit hjem er sat sammen af en eklektisk blanding af moderne design som jeg har udvalgt og købt, ofte ved en tilfældighed og sat det sammen med arvestykker, unika, loppefund jeg har renoveret eller blot givet en gang maling. Blandt andet klaveret har jeg prøvet at skille mig af med af flere omgange men det skal åbenbart ikke lykkes og nu er jeg blevet så glad for det, især når min søn, der er trommeslager, er hjemme og har følgeskab af pianister der virkelig forstår at bruge tangenterne ”. Lene Ostenfeldt arbejder med visuel kommunikation, trends- og tendenser. Hun er stylist, skribent, trendspotter, kunstner, farvekonsulent, designer og forfatter til flere bøger. Primært for virksomheder samt danske og udenlandske magasiner. Zinkvandkanden er vokseplads for frisk esdragon. Bagved skimtes plantetasker fra franske BacSac. Den sorte vintage krukke var oprindelig i lys marmor, nu har den fået en gang sort maling og med tiden charmende patina. Også udendørs hersker smukke og naturlige stillebens mellem alt det grønne. Purløg, persille, rødsalat og bronze fennikel gror i en kæmpestor plantetaske fra franske BacSac. For at give luft og hindre råd i bunden, har Lene hævet den fra terrassegulvet på en sortmalet europalle. Ud på taget mod gården ligger en vidunderlig oase. ” Her samler jeg energi, fordyber mig i noget pottejord eller en bog, nyder solen og stjernerne på nattehimlen, ” fortæller Lene Ostenfeldt. Terrassen er 15 kvadratmeter og fyldt med store og små krukker og mobile bede med forskellige bambus, hortensier, bregner, stedsegrøn hosta, efeu, masser af krydderurter, en syren, en gran og et æbletræ. Lyskæde med glødepærer fra Konstsmide skaber stemning i skumringen. Klapbord og stole fra IKEA. Marmorbord er fransk vintage. Udendørs fletsofa og søgræstæppe er begge fundet hos Bauhaus. Grillen i rustfri aluminium er amerikansk og oprindeligt designet til soldater i felten. På husmuren klatrer en tobaksplante, i krukkerne figen og citronverbena. Fra køkkenet er der udsigt til Holbæks gamle bindingsværkshuse. Køkkenbordet er egentlig lidt lavt at sidde ved, men jeg kan lide udtrykket og her er mange nærværende og hyggelige samtaler omkring måltidet. En bogreol i træ har fået hvid maling og er beklædt med tapet på bagpladen. Her står køkkenredskaber, en gammel køkkenvægt, tallerkener, kander, fade og skåle smukt og overskueligt til skue. Stentøjet, guldbestik og små vandkarafler er fra Christian Bitz, guld-termokande fra Alfi, hvid tekande fra Pillivuit, støbejernsgryde med trægreb fra Iittala. Flasken med RED-etiket har Lene Ostenfeldt designet til en styling for BO BEDRE. Væggen i køkkenet er malet med sort tavlelak og bruges til skitser, opskrifter og citater. Spisebordet er et gammelt køkkenbord i træ med skuffer. Den oprindelige linoleumsbordplade har Lene skiftet ud med hvide keramikfliser. Øverst på køkkenreolen en trådkurv fra Korbo. Fisker-pendler i metal og messing er hyggelig og praktisk arbejdsbelysning over køkkenbordet. Skoletavlen bruges som huskeseddel. En stor rund metalbakke holder orden på olier og krydderier. Vægur fra IKEA, Margretheskål i rustfrit stål fra Rosti, bogen Nopi er kokken Yotam Ottolenghi`s – som Lene er en stor fan af – nyeste. Hun nyder og har en stor interesse i at svinge potter og pander, lækkerier som her chili-honning fra New York eksperimenteres ofte ind i madlavningen. 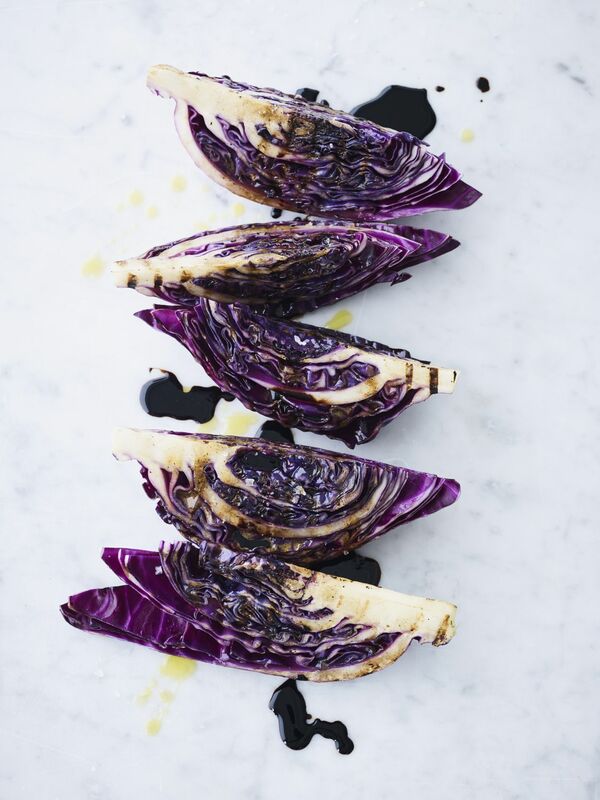 Det store spejl med guldramme gør entreen visuelt længere og fremhæver boligens flotte, gamle gulvplanker. Væggene er malet med en ultramat lys grå fra Flügger, farven stopper cirka 40 cm fra loftet, det gør rummet visuelt lavere og mere intimt, stemningen understreges af glødepærer i messingfatning med stofledning, Raumgestalt fra Nicolaj. Lågen der anes i spejlet er walk-in garderobe og holder entreen rydet for overtøj, sko, tasker og kufferter. Alle vægge i det store arbejdsrum er malet utraditionelt. Den mørkegrå farve, som går igen i karnappen i stuen, slutter midt på væggen og virker som et panel der fremhæver de originale trægulve og hvide træværk omkring vindue og døre. Arkitektlampen er Luxo designet i 1937, pendelen over bordet har Lene Ostenfeldt købt for 40 kroner på den lokale genbrugsstation. Den blev slebet med sandpapir, fik en gang blank spraymaling og en ny ledning. Ateliertaburet i træ er fra Lene`s far der malede i sin fritid, den sorte taburet er fra Trævarefabrikkerne og har fået en gang sort maling. Hæve- sænkebordet er ekstralangt, 2 meter, og lavet på bestilling hos et kontorfirma. Kombinationen af mørkegrå og hvid er elegant og fremhæves her med pude og sengetæppe i samme nuance. Tekstilet er genbrug, Lene har syet det af velour der tidligere var gardin i stuen. Bordlampe fra IKEA. I arbejdsrummet fungerer en stålreol fra byggemarkedet som opbevaring. 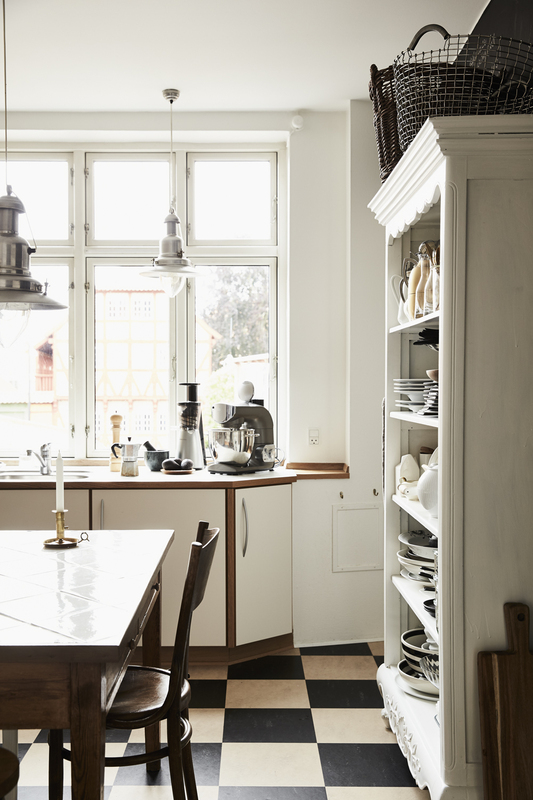 Øverst en samling af vaser fra Holmegaard, Lyngby Porcelain, Royal Copenhagen og Broste Copenhagen, et diskret og effektfuldt stilleben. Skuffedarie i teaktræ er et arvestykke. Gråt metalskab fra IKEA. Den store stue er delt op i en spise- og hyggeafdeling. Stolen forrest er Lenes fars gamle kontorstol der har fået nyt polstret sæde i kaffebrunt læder. 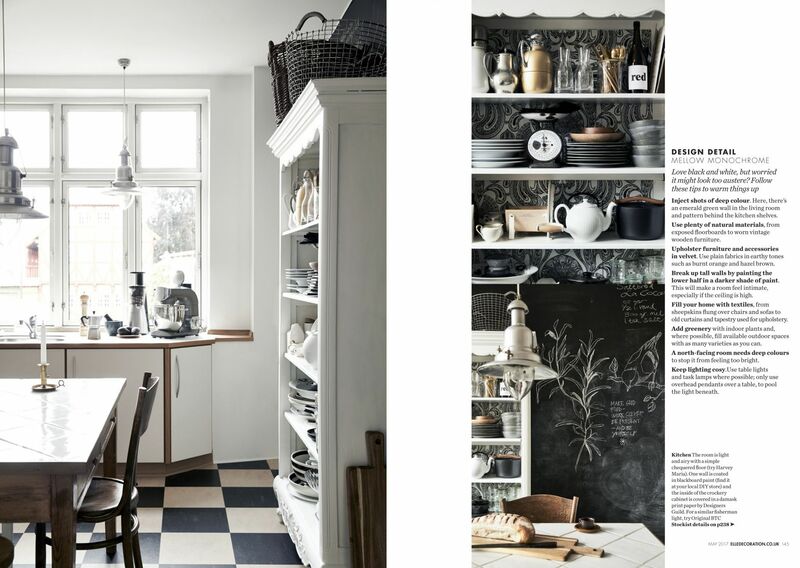 På klaveret et tableau af stager og vaser i keramik, porcelæn, træ og marmor. Håndmalede roser er skitser til et nyt projekt. Fotografiet har Lene taget i Istanbul. Lampen i mundblæst opalglas er Claudia fra DAB. Karnap og panelernes udskæringer fremhæves med en dyb mørkgrå træmaling, Flügger S7000-N, definerer spiseafdelingen. Pladsen under bænken agerer bogreol. Spisebordet i massivt egetræ med tyk glasplade har Lene Ostenfeldt selv tegnet og fået udført på et beskyttet værksted. Stolene er en blanding af Kartell, designet af Piero Lissoni og arvestykker. Den industrielle stol er fundet i en container. Kvinde fra Nepal er fotograferet af Lene Ostenfeldt og forstørret. Indskudsborde i teaktræ er arvestykker, den hvide bordlampe hedder Spun Light er designet af Sebastian Wrong og fra Flos. Krukke på gulvet er unika fra Bing & Grøndal. Bag dobbelte glasdøre i forlængelse af stue- og spisestue skimtes Lene Ostenfeldts arbejdsrum. Over bordet hænger pendel fra Kartell. Portrættet af keramiker fra pottemager-byen Thimi er fotograferet af Lene Ostenfeldt på en rejse til Nepal. Lampen, et retro-fund, har hun malet i den orange der går igen i fotografiet. 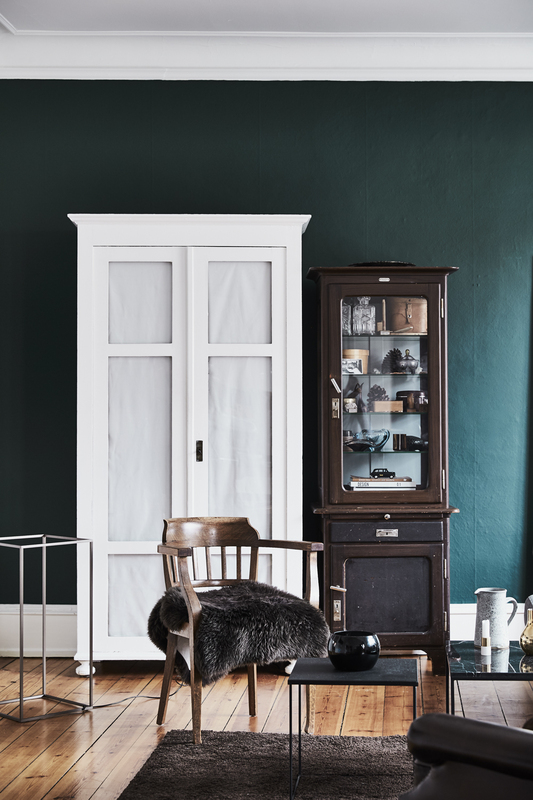 Skærmen fra KS Skærme er lavet på bestilling og betrukket med lækkert velour fra Designers Guild. På radiator isbjørn fra Royal Copenhagen. Vægfarven på stuens endevæg er mørk grøn Flügger S7020-B70G og helt uden glans. Den både fremhæver og giver kant til de brune, sorte, grå og hvide farver. Sofaen er fra Ilva med puder Lene har syet i tekstiler fra Designers Guild og Ralph Lauren. Den brune læderstol er Chesterfield. Maleriet er et af Lenes egne. Vitrinen er et arvestykke, det forlyder at det har stået på en ”hemmelig lægeklinik” i Sønderjylland hvor Lene kommer fra. Karlekammerskabet har Lene lakeret hvidt og sat glaslåger i med hørlærred for. 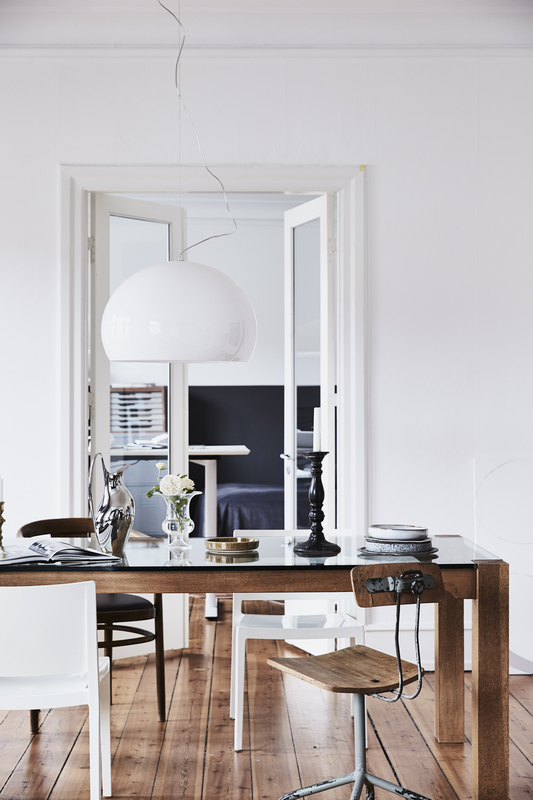 Gulvlampen hedder Slim Sophie fra tyske Frau Maier, spot er Parentesi fra Flos, design Achille Castiglioni. Vitrinen er en udstilling af finurligheder. Hver detalje repræsenterer et personligt minde der er betydningsfuldt. En kogle fra en ferie, en cigarkasse med knapper, et træskib Lenes søn har bygget da han var dreng med en lille hammer af en trommestik, en sten fundet en særlig dag på stranden, en 100 år gammel bonbonierre Lene fik bolcher af som barn hos sin farmor, byggeklods i træ fra LEGO`s allerførste produktion. Bagvæggen i skabet er malet lys grå, samme farve som i entreen, der fremhæver kuriositeterne. En kreativ hjerne arbejder altid. Lene har altid sine skitse- og notesbøger med sig på rejser og slapper af med tegneblokken. En notesbog bruges til at skrive og skitsere særlige tilberednings-fif og lækker mad spist rundt om i verden og hos venner og familie. Bog How To Make A Nation er fra Monocle. Akvarel er skitseforslag til print. Soveværelset, der vender mod syd og tagterrassen, er enkelt indrettet. Sengetæppe og pude har Lene syet i fed velour fra Designers Guild. Farven hedder Cassia Hazel. Stolen er original Thonet, fundet på et loppemarked for 35 kroner. 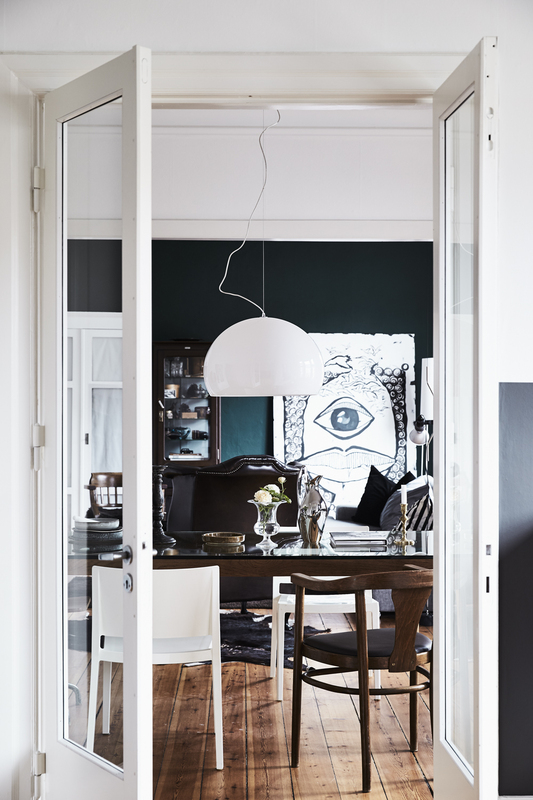 Lampen på gulvet er Gatto fra Flos, designet af Achille og Pier Giacomo Castiglioni. Fotografi er Galata broen i Istanbul, taget af Lene Ostenfeldt. I loftet har Lene lavet en pendel af en gigantisk lampeskærm fundet på et udsalg. 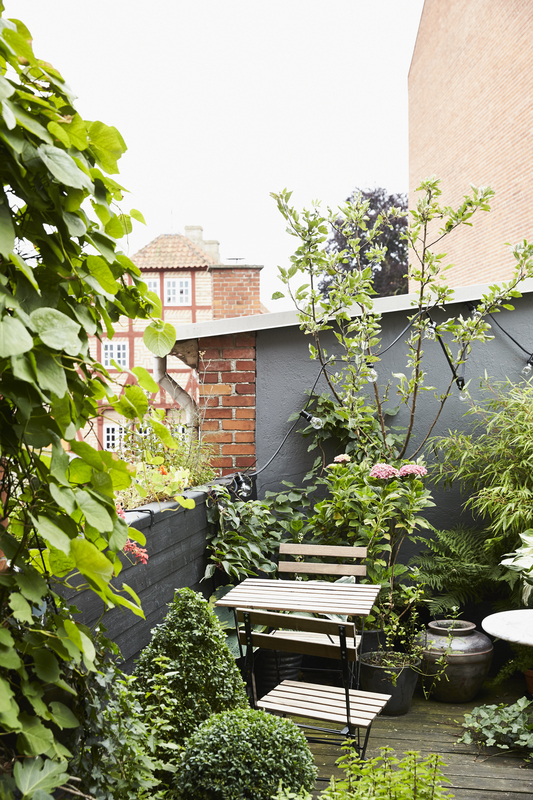 Lejligheden har udsigt til både gården og gaden. Fra soveværelset er der udgang til tagterrassen mod gården. På væggen hænger et af Lene Ostenfeldts egne, store malerier, en serie af sort-hvid stregtegninger af spiselige nordiske planter og rødder. Gulvtæppet er Almeria Stone, håndtuftet i viscose fra Linie Design.